Since we've, like, spent all this money to send guys to Japan and stuff, I'm going to burn through my meager stash of Japanese DOTS cars like there's no tomorrow! So in a couple of weeks, when all you're seeing is Alameda's Deetroit and Yurpean stuff, you all will be entitled to some bitter complaints about my profligate squanderation of all the Japanese car photos (no doubt prompting me to run right out and shoot a bunch of '94 Sentras and '01 Odysseys). But for the moment we're going to live it up, with our third Datsun in as many days! Who cares about the future? The 1981 model year was the last one before Nissan started their de-Datsunification rebranding process, though they were already laying the groundwork with these "By Nissan" badges. That reminds me of a joke, told to me by my ice-racing grandfather: Back in the day, some Nissan execs decided they needed a catchy brand name for their export-market cars, so they went to Germany to get some advice. "Mercedes-Benz... Porsche... Prinz... all great names!" the Nissan suits told the German image consultants. "You Germans are really the best at such names. Only thing is, we need our new name by 5:00 PM tonight." "Ach du lieber, dot soon?" cried the poor stressed German. Ha! Get it? Dot Soon? Yeah, it's a knee-slapper all right. You folks have been great- come back to Rafael's Silver Cloud Lounge tomorrow night for my next show! In this view, you can really see that Nissan was starting to get rid of some of the quirkiness in their designs by this point; this front end is far more generic than the B210 of just six years earlier. Yet during the same period the build quality and longevity of their cars had gone from "not too bad" to "pretty damn good," with more rapid improvement to come. Must one be traded for the other? 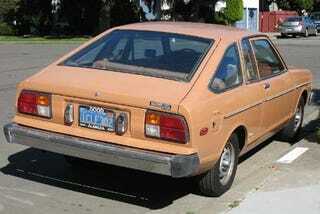 In any case, this 210 still retains enough of the distinctive Datsun style to merit DOTS status.